Last Friday when I picked up Piper from preschool I learned that she was slated for Star of the Week status. I happened to notice that the classroom was tackling the “O” as their next letter and remembered a conversation a few months back in which Piper threw herself on the ground complaining about how very much she detested the letter “O.” I don’t know what “O” ever did to her, but somewhere in the back of my brain, I remembered Star of the Week. So, I did the unthinkable. I asked Piper’s teacher. I regretted the words as they slipped from my mouth. Who doesn’t know when their child is scheduled for the illustrious Star of the Week? Sorry. I’m a little bitter over here. Right. January. Let me think back through four months, six trips, nine house guests, and two full-time jobs. You’re right. I’m a loser mom. “Do you think you could just give me the instructions again? My husband probably lost them.” Oh, snap. Threw Piper’s dad under the bus. Sorry, honey. Preschool teacher made me wait in the hall ten minutes. It felt like detention. “I can see you now,” she called from inside the room. Piper and I came in, our heads hanging low. “I will? Can’t Piper do it? I mean. It’s about her, right?” Strike two. The wall was covered with professionally printed Star of the Week posters. Laminated. With Glamour Shots. They were perfect. I winced. We don’t eat Oreos. Unless Grandma and Grandpa are in town and sneak them under the table. Preschool teacher all but rolled her eyes. I have such trouble brainstorming the beginning letters of words these days. Thank goodness for Google. Whew. I know. What kind of a four-year-old isn’t reading yet, right? Strike three. 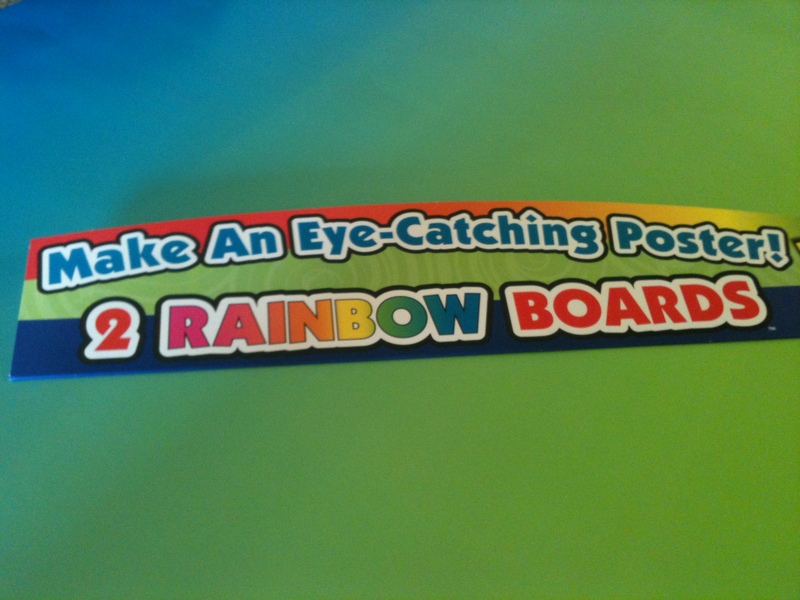 A poster board in Rainbow! Who knew? Then, she and Sissy spent a couple of hours Saturday afternoon printing off pictures from the blog. As a total slacker mom I don’t have loads of spare pictures of my kids waiting for arts and crafts projects. Thus, the need for this blog. Piper cut and pasted the pictures herself and did the labeling. Lalaloopsies made it on to the poster board somehow. They’re a big part of our family. It was way out of my hands. Piper is pretty proud of her board. It’s hers. Really, really hers. We also negotiated the snack from Oreos to healthy oatmeal raisin treats. Piper vetoed okra chips and oranges. I’ll be biting my tongue. Why? Because Piper is Star of the Week and she’s doing it her way. 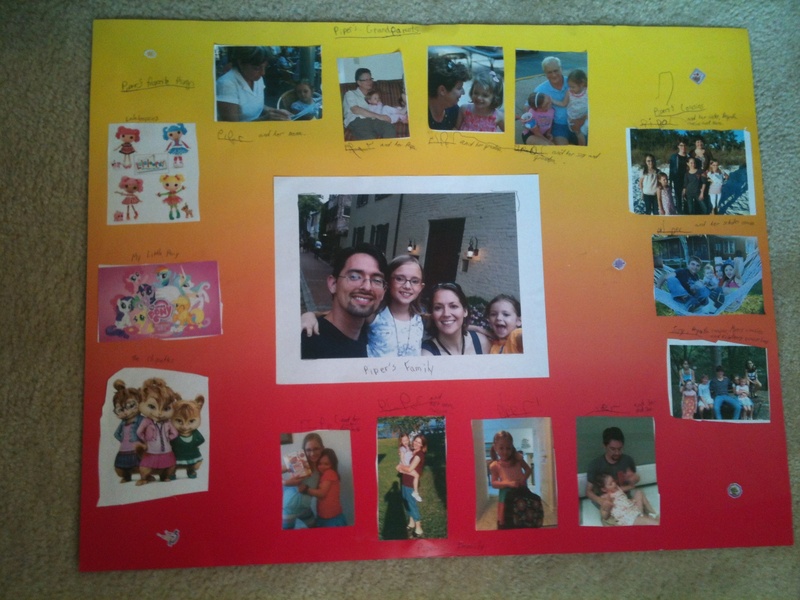 This entry was posted in Daily Dharma and tagged arts and craft projects, kids should do their own homework, oreos, parenting, piperism, poster board, preschool, rainbow colors, snack time, star of the week by melissa.scholes.young. Bookmark the permalink. Nancy’s mom and your mom are totally fancy on the the INSIDE. That’s where it really matters, sister. 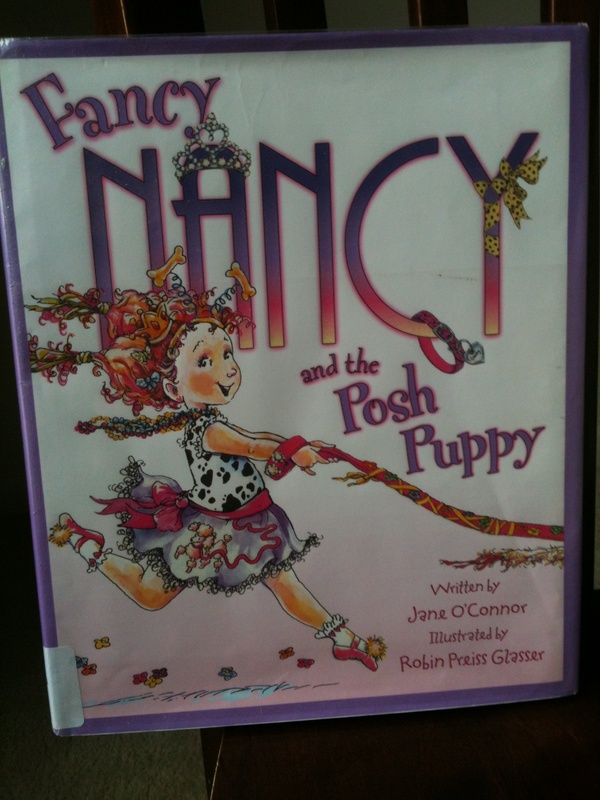 And don’t forget that when Nancy’s mom needs to she can still rock the FANCY. I love that Piper carves and craves her own way. And, Mama? I’m glad you do, too. Thanks, friend. This parenting thing is a tough business. I doubt my equipment daily. Piper missed the P’s by one week – what kind of preschool teacher (especially one that expects directions from January to be retained) doesn’t take into consideration children’s first names when making Star of the Week decisions? Now that is an excellent point, Beth. I hadn’t considered how easy the letter P would have been. A crowd pleaser in our house for sure. The January thing still boils my blood a bit. Maybe we all need to cut each other some slack and remember we’re on the same team. I’m glad you’re in my corner! I’m so glad La La Loopsy made it on the poster. Seriously, what teacher chides your 4 year old for not reading and doesn’t offer another copy of the requirements? Snack that starts with O? Hmm, oatmeal bars I guess is the best- how about Old fashioned donuts? Oh wait, I guess that’s as unhealthy as Oreos. You could have them wash it down with some Ovaltine! Lalaloopsies, Chippettes, and the flippin My Little Ponies got equal play. Clearly, this Virgo wasn’t involved. I had to resist the urge to not take the poster apart once she went to bed and clean up the cutting edges and repaste it all in straight lines. I did resist, though. But I have to say I’ve been hanging out in the preschool hallway a little extra long this week just waiting for a snide remark so I could unleash. I think I’ll go toast my self control with some Ovaltine!